Obviously I was not the only one who chose this spot to see the eclipse. 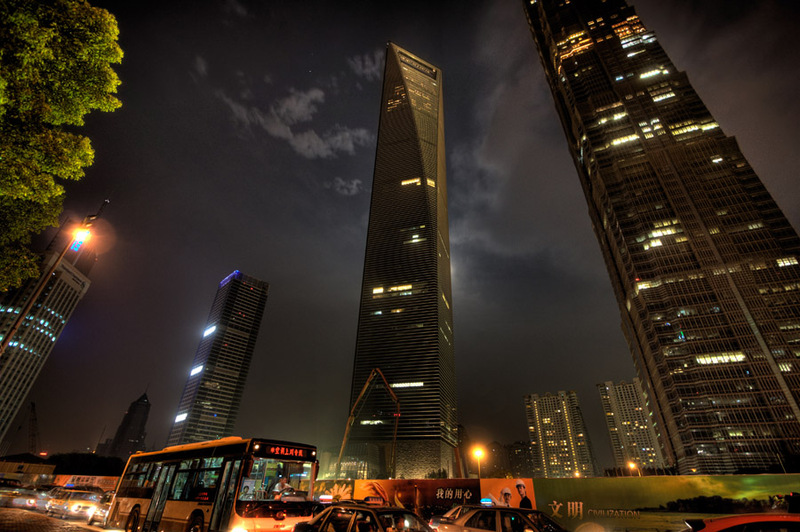 The plan was to see the the totality trough the top hole in the financial tower. 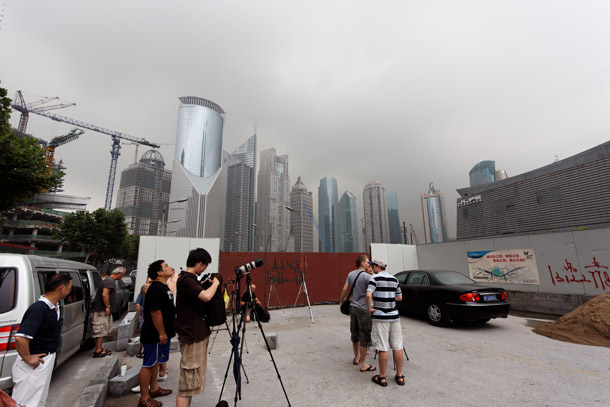 Just a few minutes before the show, dark clouds appeared from the west. Below is the actual view during the full eclipse. 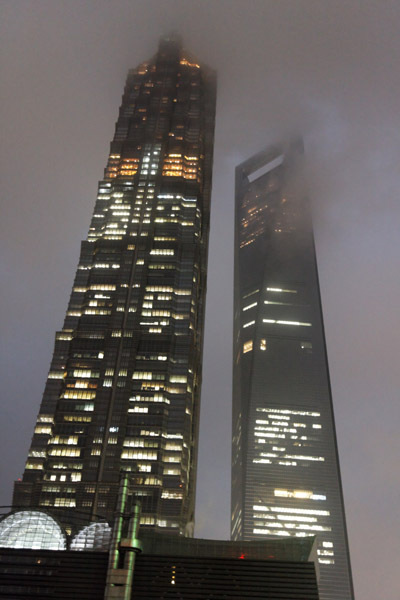 At least it got dark...and about 20 million other people around also didn't see more. 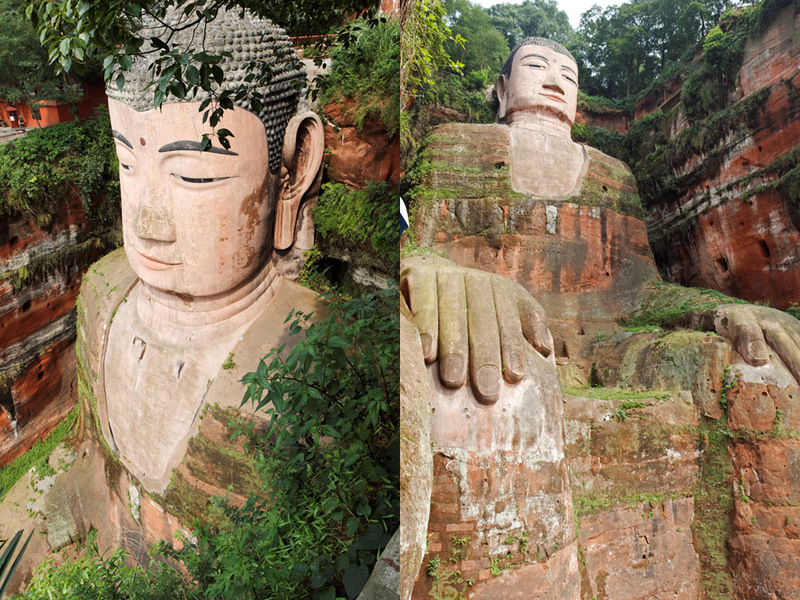 Today's excursion took me to Leshan, about 130km from Chengdu. 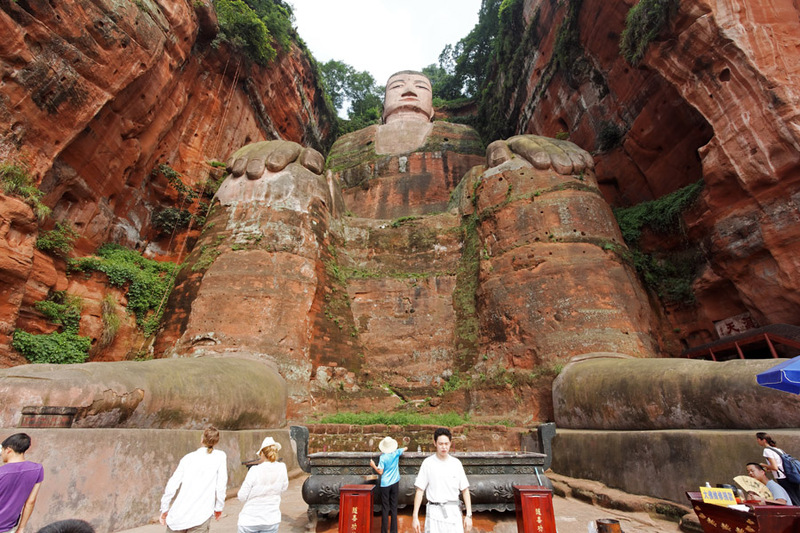 The main attraction of Leshan is the 71m high Buddha statue built during the Tang dynasty (around 700 AD). 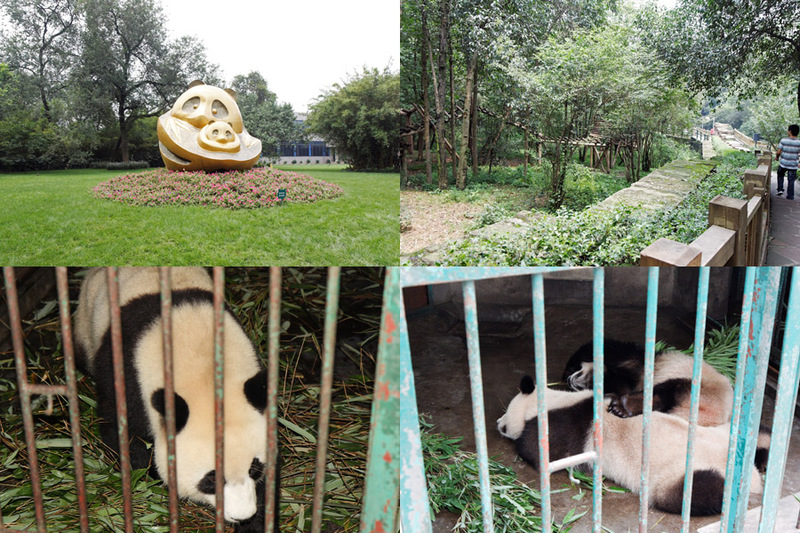 I made a short trip to the famous Chengdu Panda Research Base. 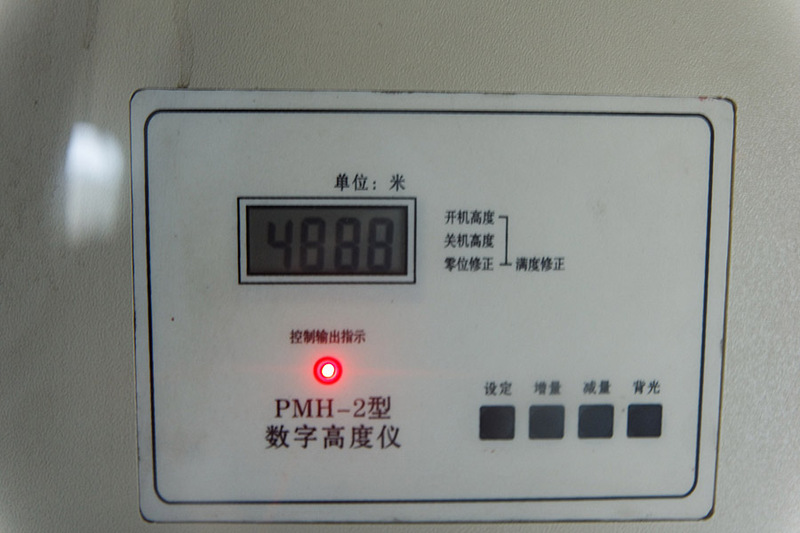 The site contains huge open spaces for Pandas, which were all empty, because the bears, due to the hot weather, all stayed inside the air conditioned cages. 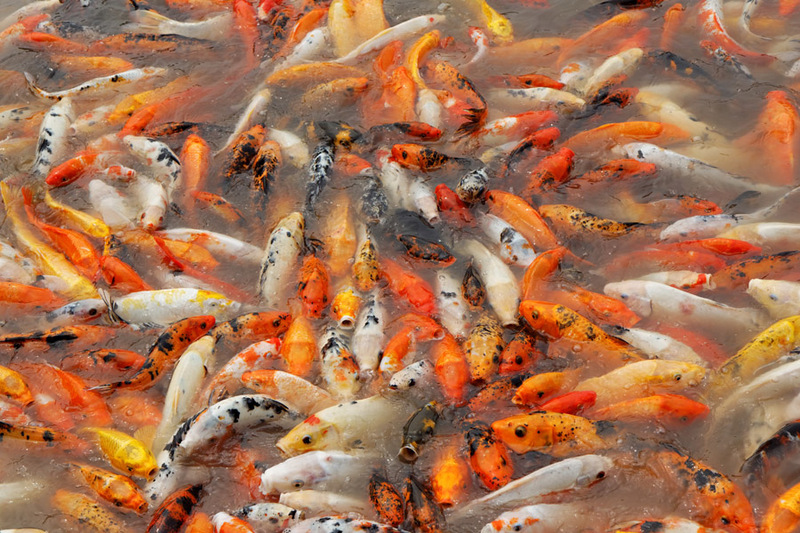 Scene at the pond.....almost more interesting than the Pandas. 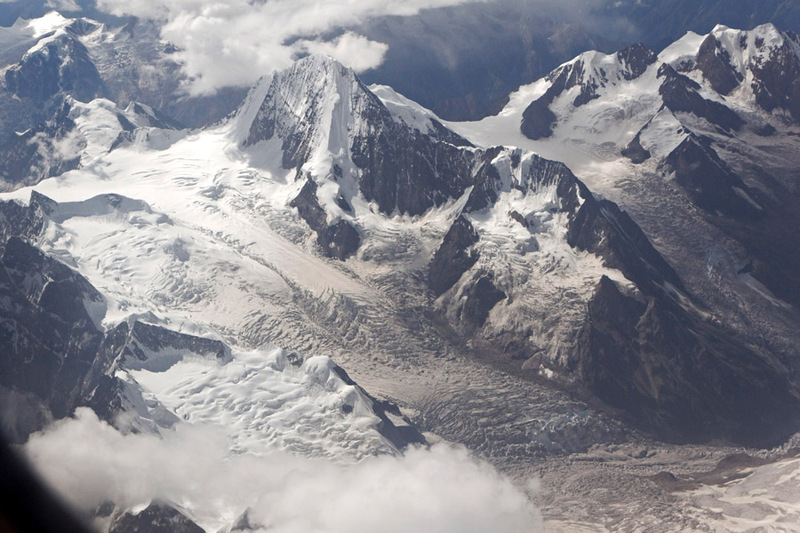 The two hour flight from Lhasa to Chengdu took us over a mountain range 4 times longer than the swiss alps. 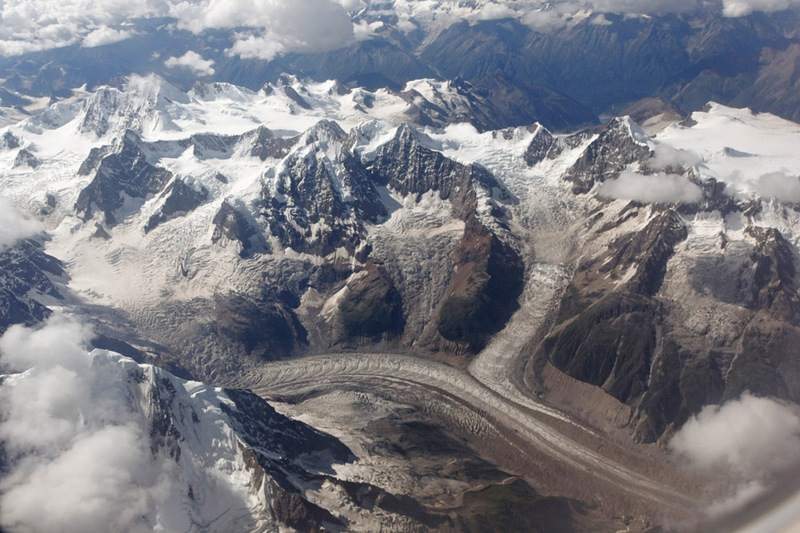 Although the weather was mostly cloudy, a large number of glaciers in the Nyainqêntanglha Shan mountain range could be seen. Click here to open in Google Earth. 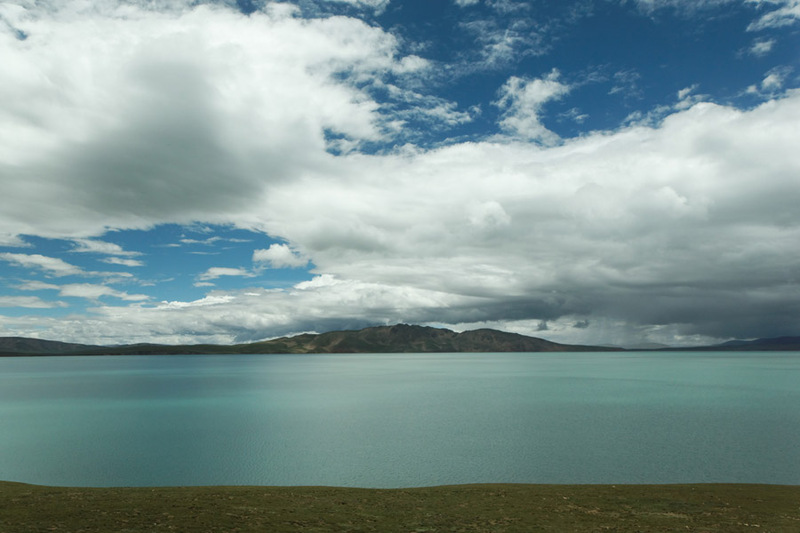 250 km from Lhasa is the highest saltwater lake in the world, the Namtso lake. 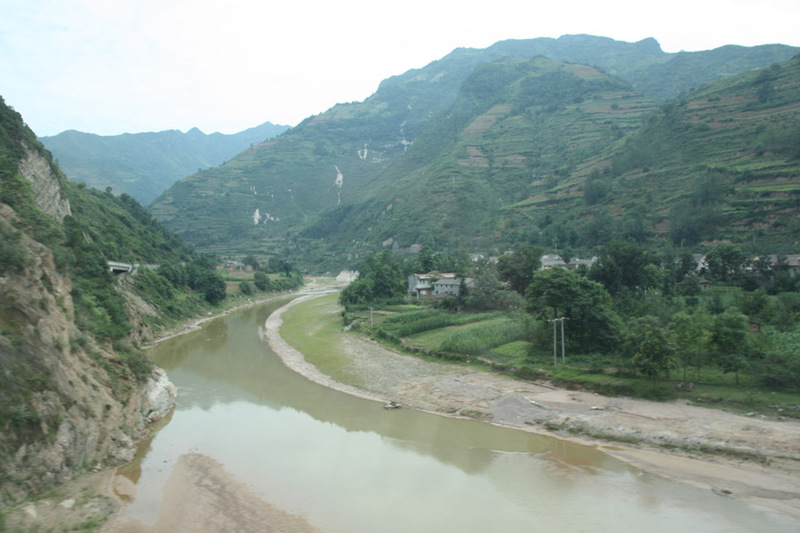 To go there we hired a minibus and drove down the valley to Damxung, along the railway line. After Damxung we had to cross a pass (shown above) of 5150m. 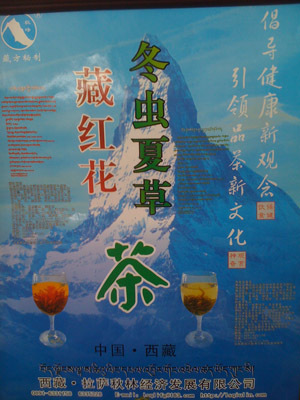 Popping a painkiller and two Gaoyuanan ("High Plateau Peace") pills before the peak.....and no problem at all. Untouched nature at an altitude of 4718m. 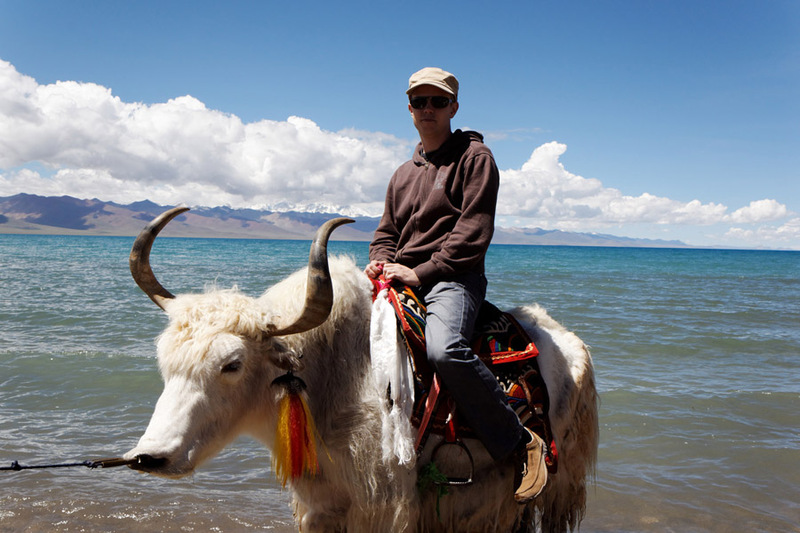 Ok, that was a lie...hordes of tourists line up to ride on yaks, including this shady person here. 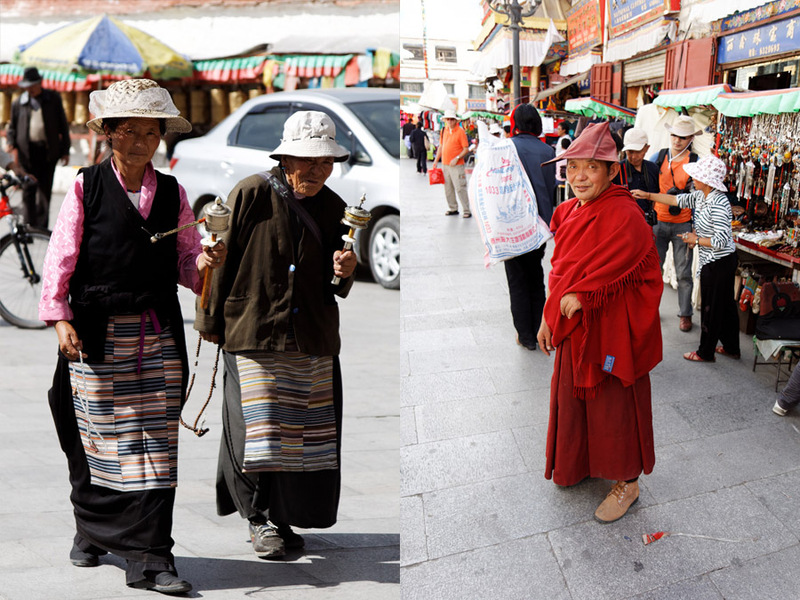 Today we visited the nunnery of Lhasa. 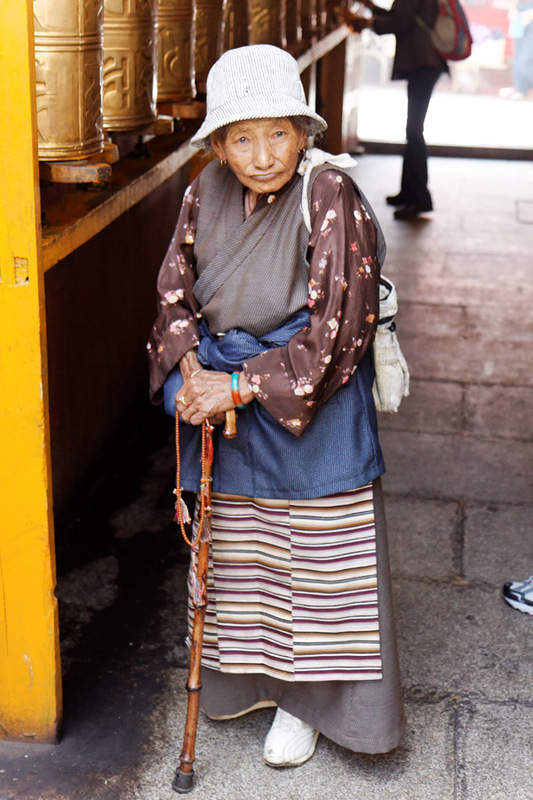 The nuns were very friendly and we were offered each a big cup of the infamous yak butter tea. 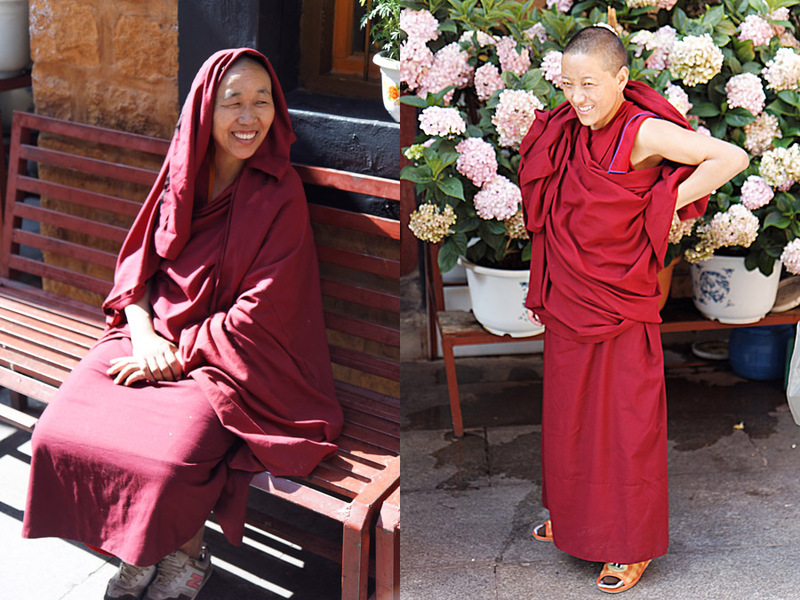 These nuns prepare prayer papers for later use in the praying wheels. 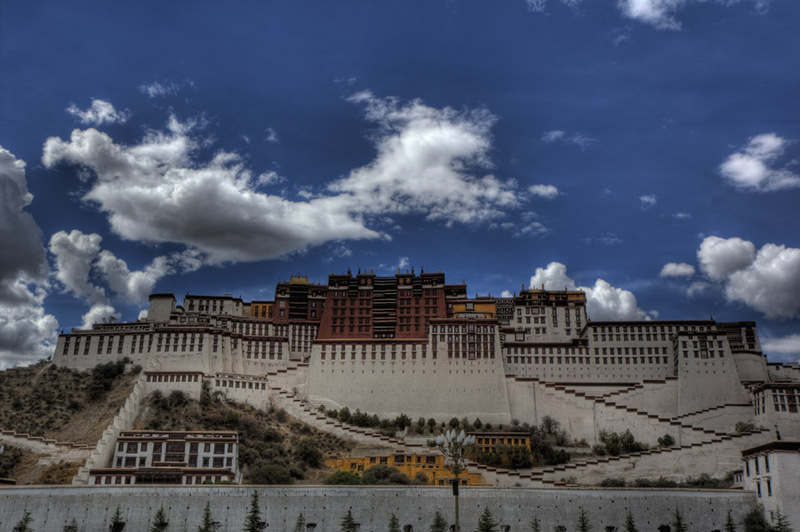 The potala palace was the winter residence of the Dalai Lama. 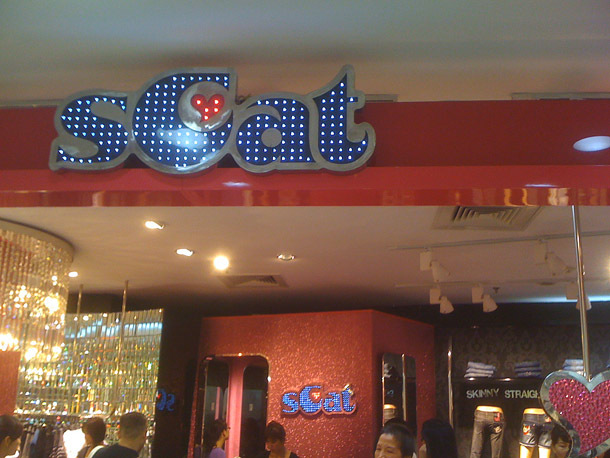 It has now been converted into a museum. 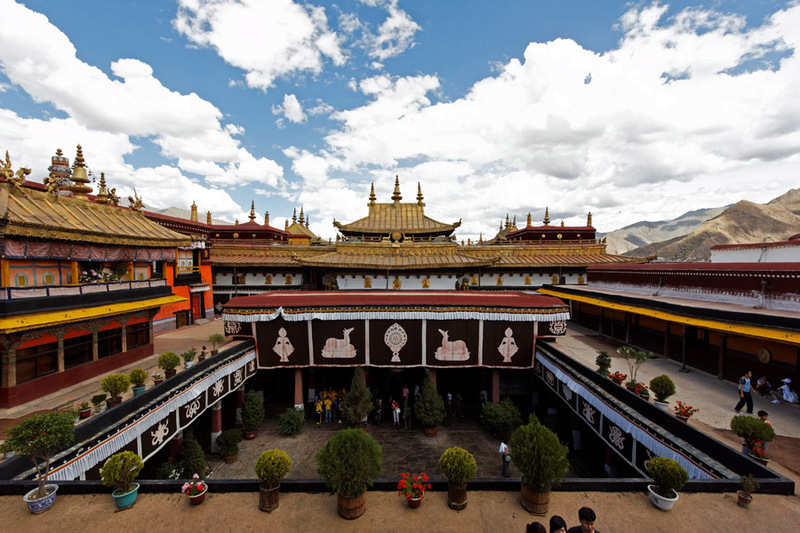 The Jokham Temple was built in the 7th century and contains the most venerated Buddha statue in Tibetan buddhism. 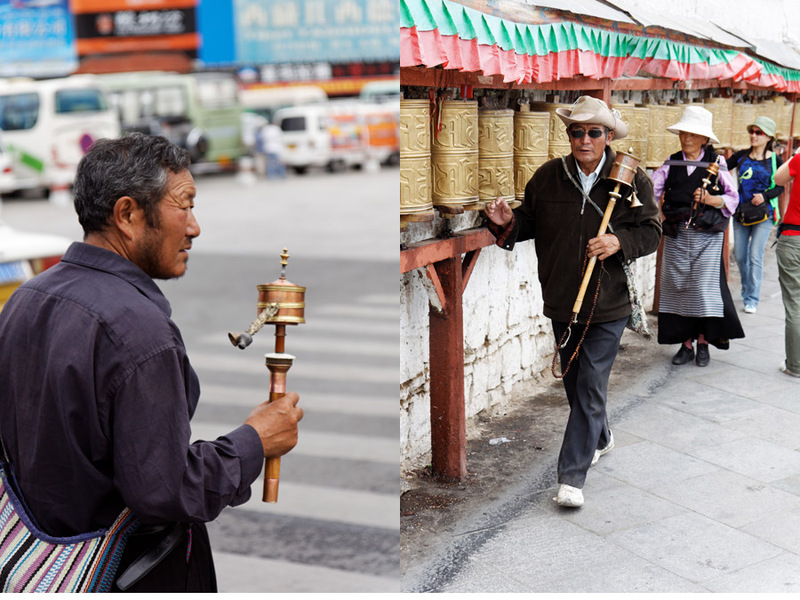 In front of the Buddha was a big assembly of people praying. Some brought their own small Buddha statues with them to charge them up for later use at home. 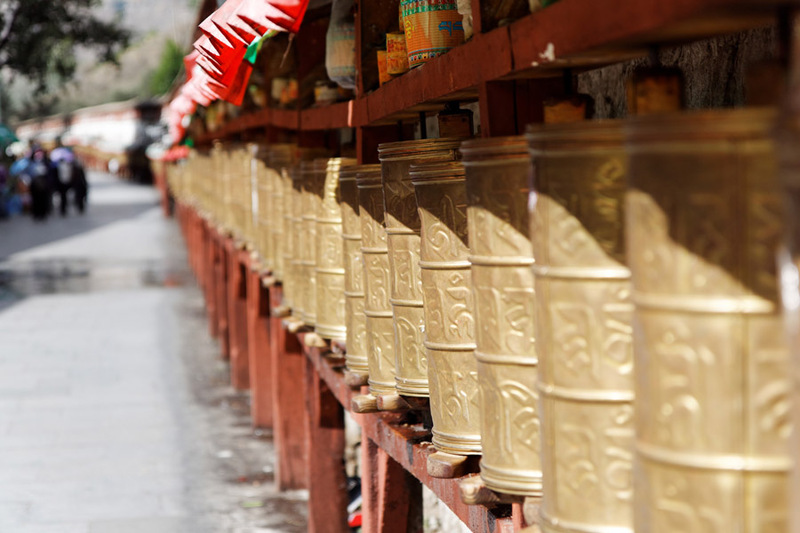 Prayer wheels are prime examples of efficient automatization and intelligent engineering applied to religious practices. 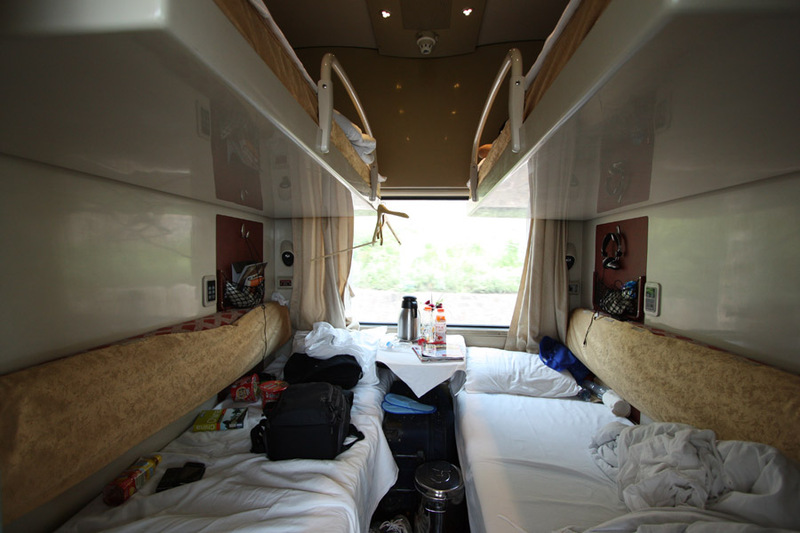 When I woke up the train was already in the Qinghai-Tibet Plateau. At 6 o'clock in the morning the first snow covered mountains appeared. 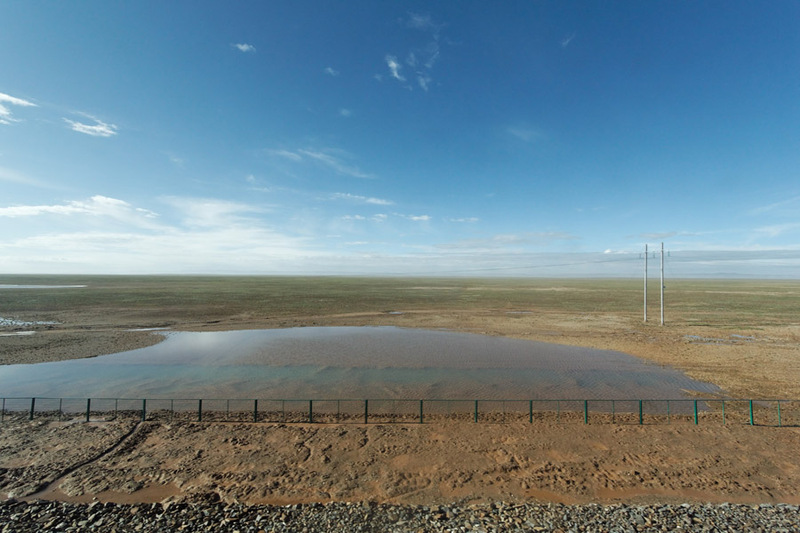 The next 4 hours the train passed through the Kekexili area (83'000 square km), the worlds third least populated area. 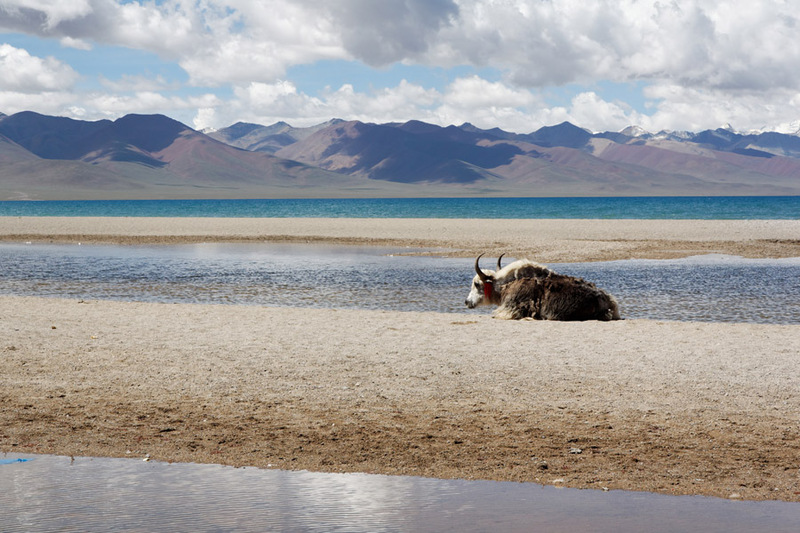 However a lot of wild life including rabbits, wild yaks and sheep could be seen all over the place. 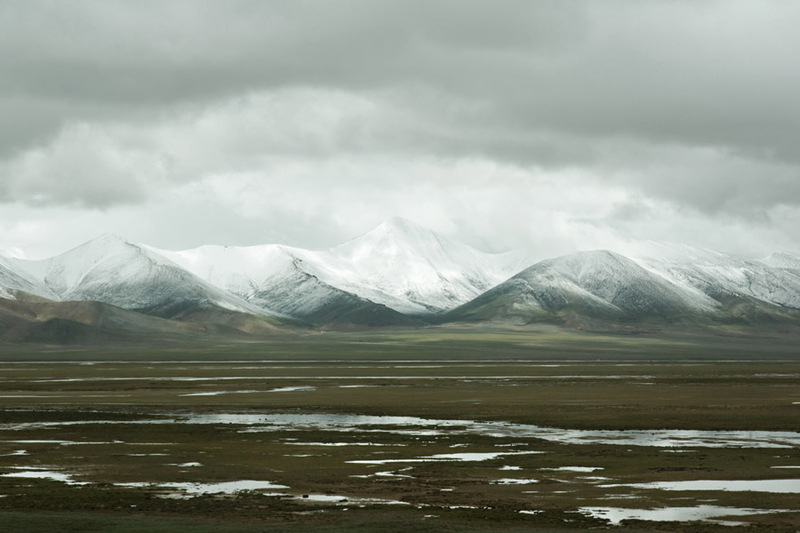 Passing the Tanggula Mountains. 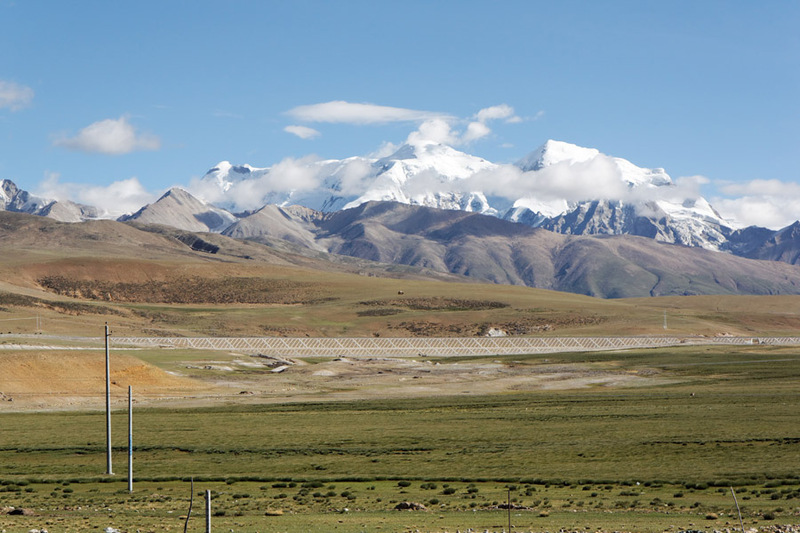 The mountains are up to 6600 m in height. 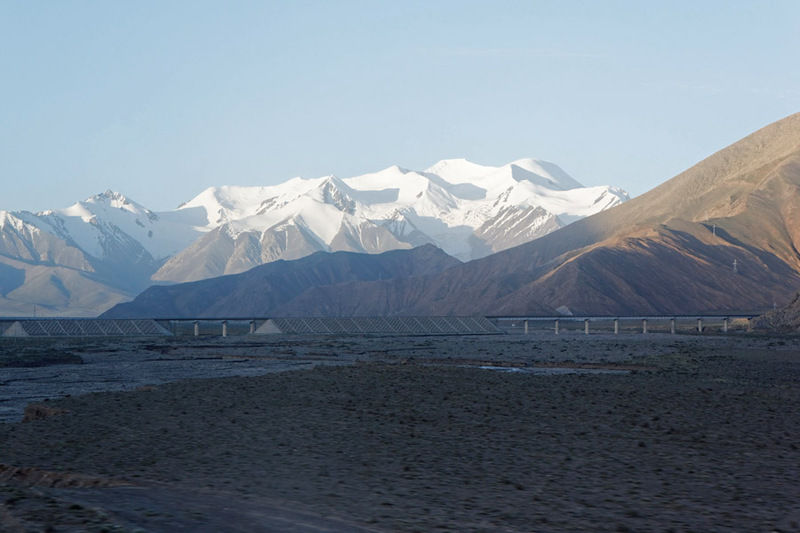 After Tanggula mountains the train passes the highest elevation. 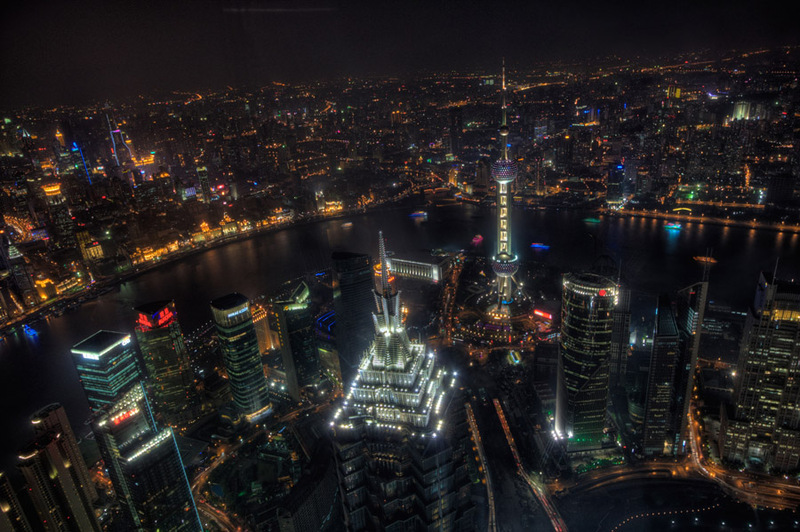 The picture was made at 4888m. 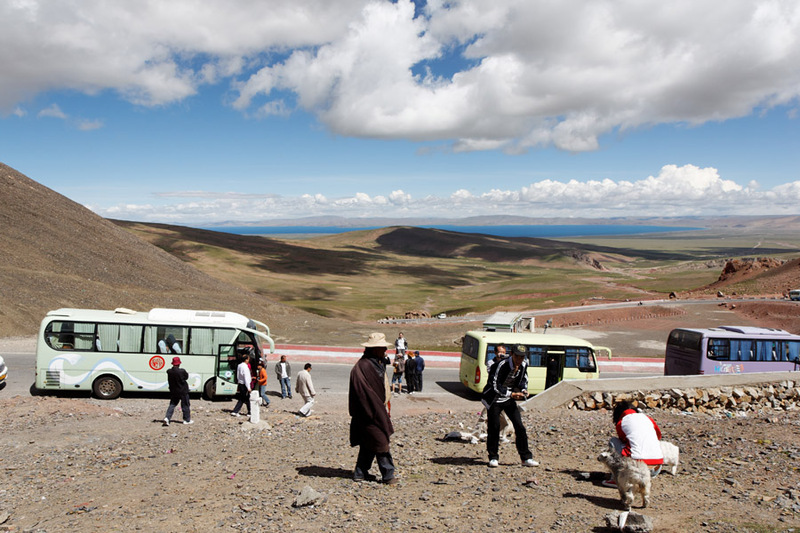 Shortly after we passed the Tangula rainway station, at 5068 m the highest train station in the world. I was a little disappointed, that the train did not stop for a breath of fresh air. Passing the Cuona lake at 4595m. This is the highest freshwater lake in the world and double the size of Neuenburgersee. My cabin (lower left bed). There were 3 other adults and one small kid in the same compartment. Initially very green, the landscaped turned to desert after a few hours. 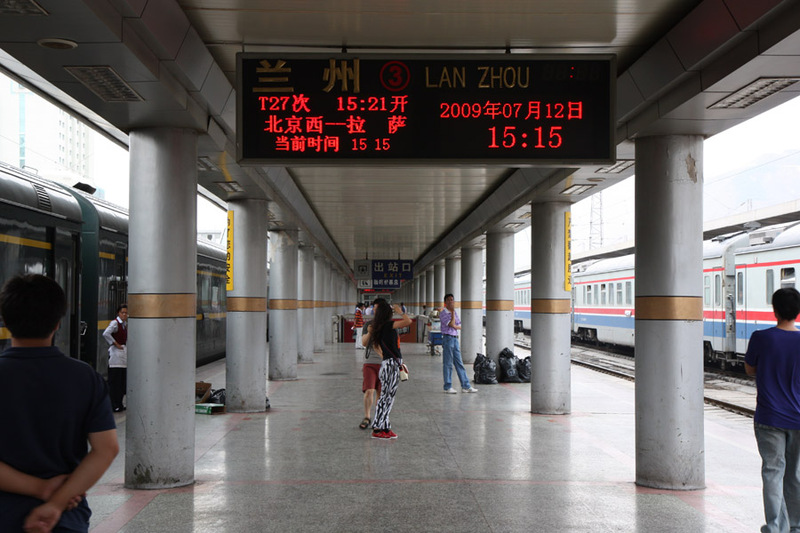 Arrival in Lanzhou after 7.5 h. People could quickly leave the train and buy some more instant noodles. 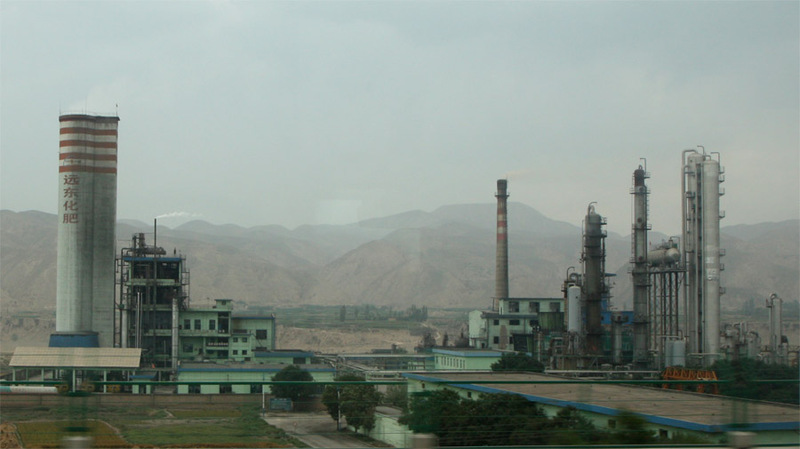 Arrival in Xining, the quite unattractive remote capital city of the Qinghai province. 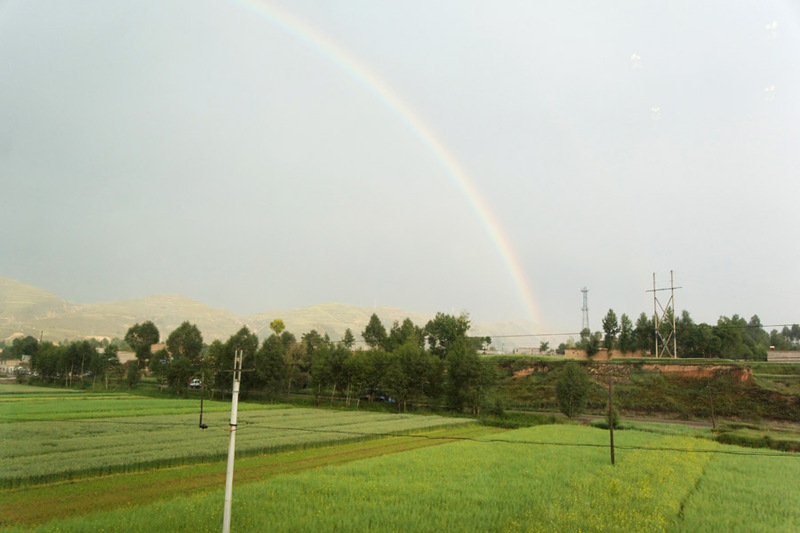 After Xining it got more fertile again and we witnessed a big rainbow. Soon after it got dark. 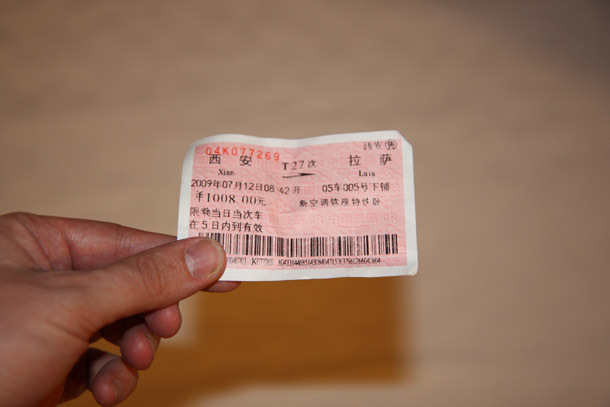 Ticket from 西安 to 拉萨. 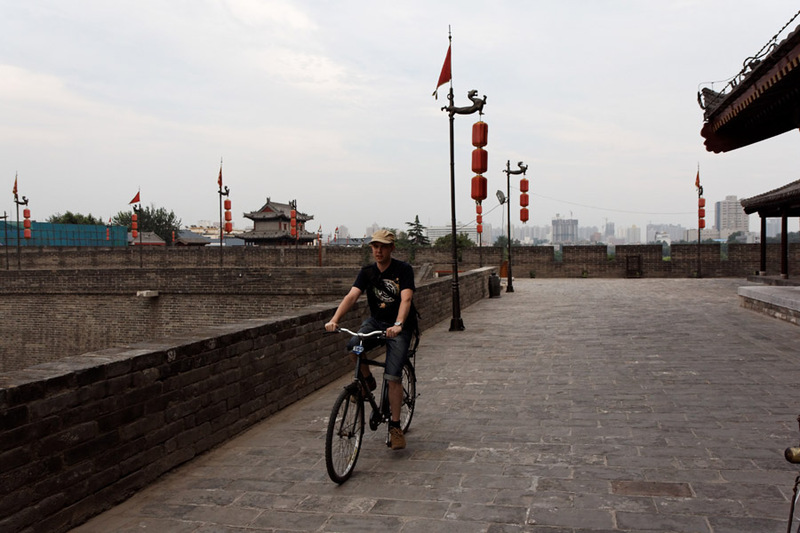 Today I did the most touristy thing to do in Xi'an: Riding a bicycle around the 13.7 km long city walls. 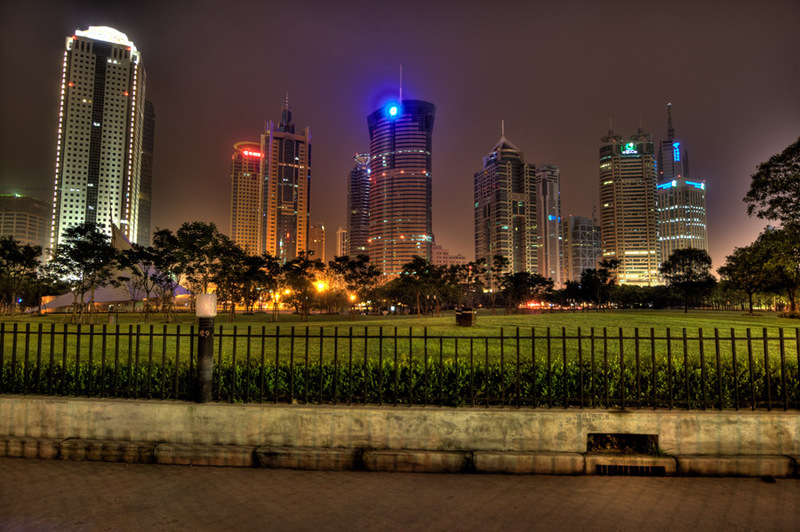 The bell tower at night. 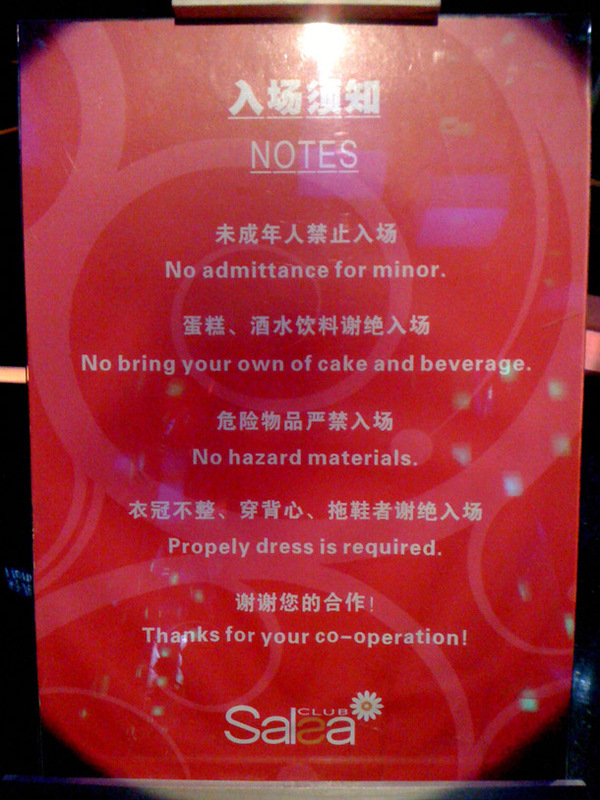 Even though I had to dispense the cake I was carrying with me, It was good fun in the club afterwards. 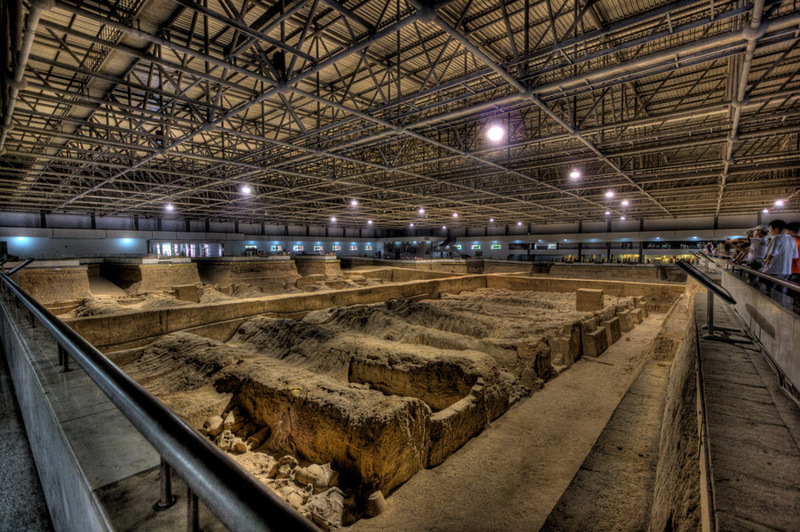 About 40 km from Xi'an is the excavation site of the Terracotta Army. 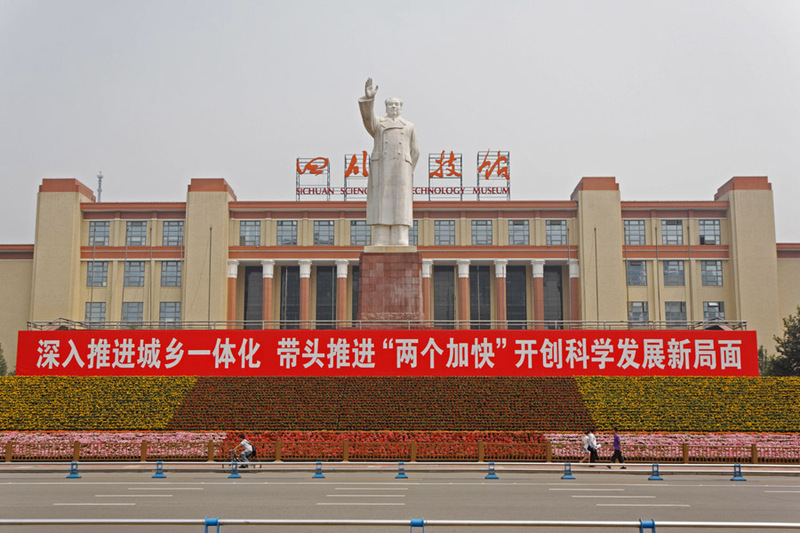 Each year 6 million people visit the largest on-site museum of China. 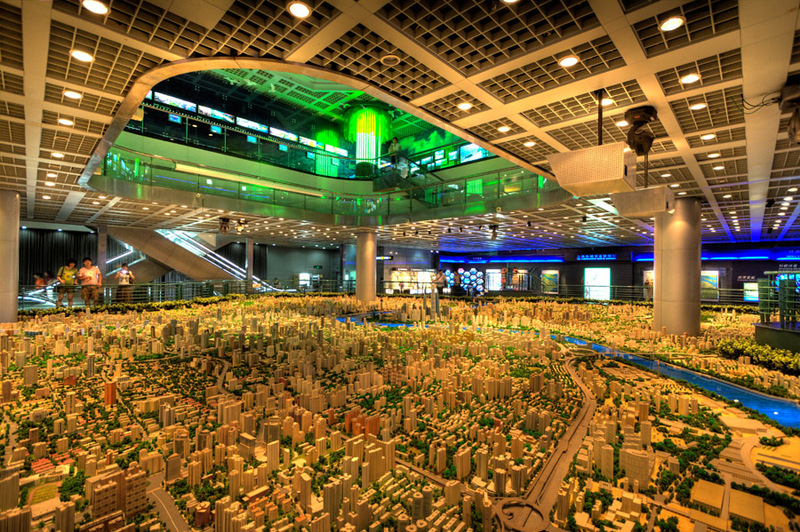 The museum contains three large buildings (the main one above is 230m long) where the excavations are shown. 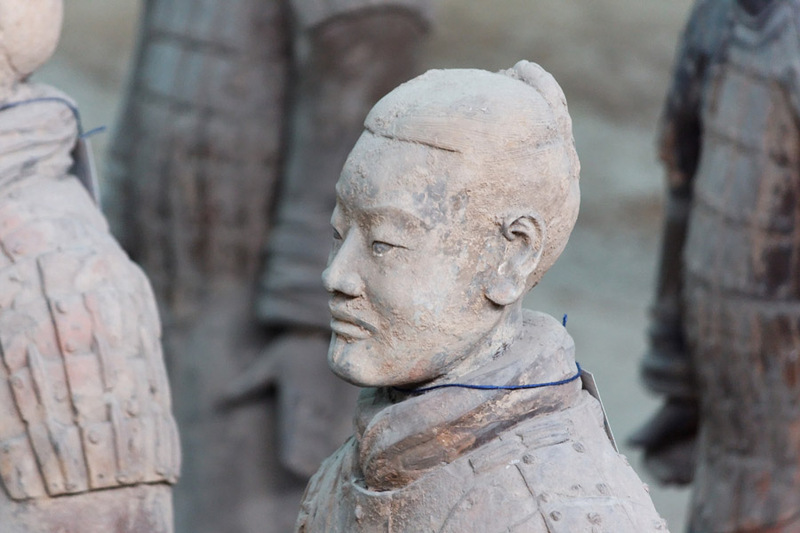 Archeologists are on site and constantly discover new clay figures, reassemble them and put them on display (There are an estimated 6000 soldiers buried underground). 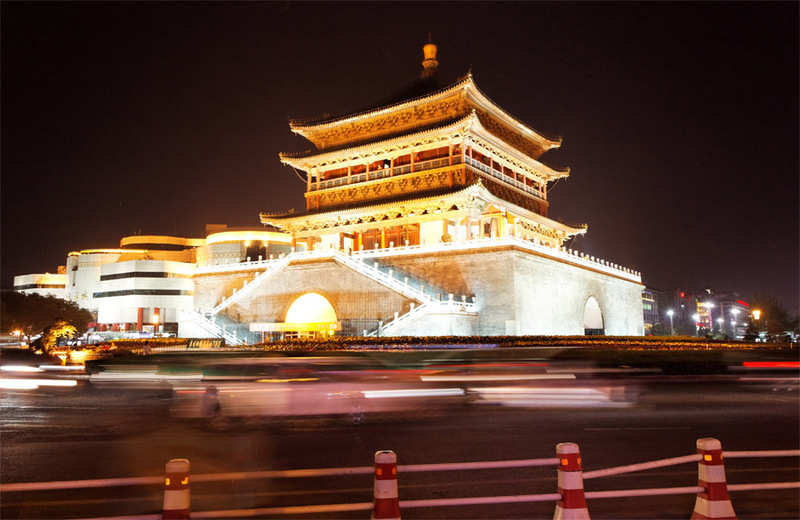 The museum is part of the much larger mausoleum for Qin Sihuang the first emperor of China. 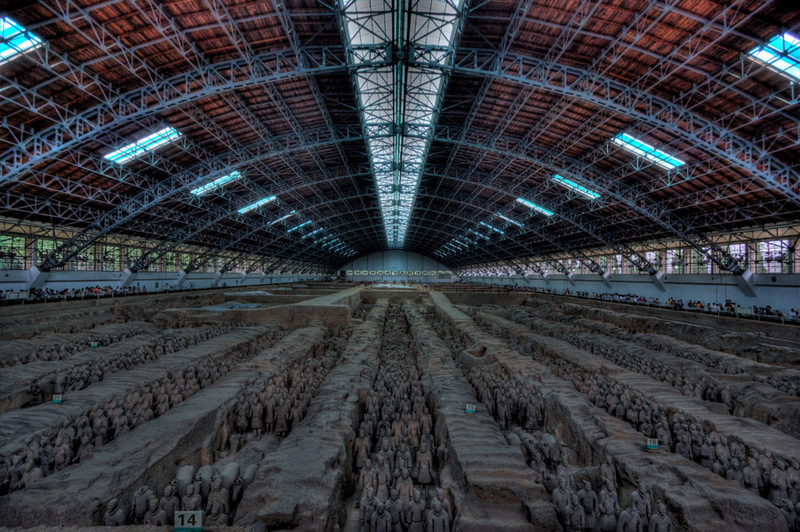 The Terracotta Army was only discovered 1974 by a farmer who was digging for water. Now in his 70ies the farmer himself was in one of the adjacent buildings and signed my copy of a book about the site. 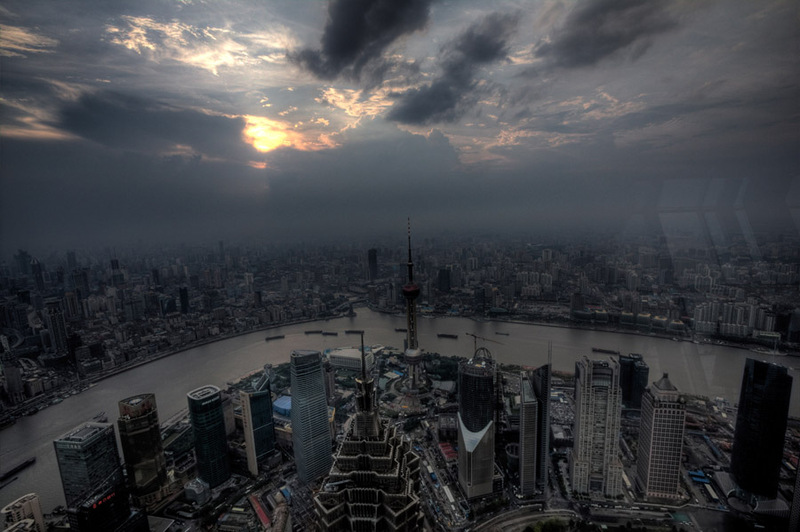 Today I flew right in the middle of China to the ancient capital city of Xi'an (formerly Chang'an). 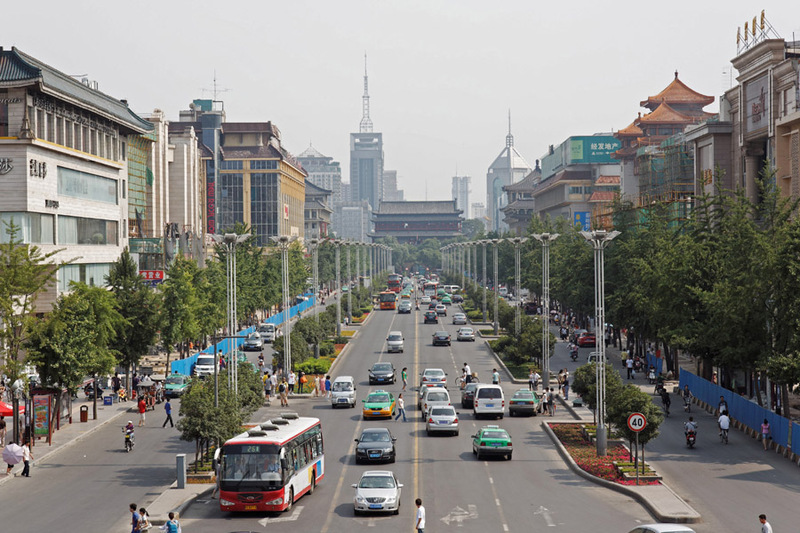 Xi'an is a bustling city with several millions of inhabitants and lots of construction going on in the outskirts. Inside the surrounding city walls the city kept its unique flair of mixing ancient with modern buildings. 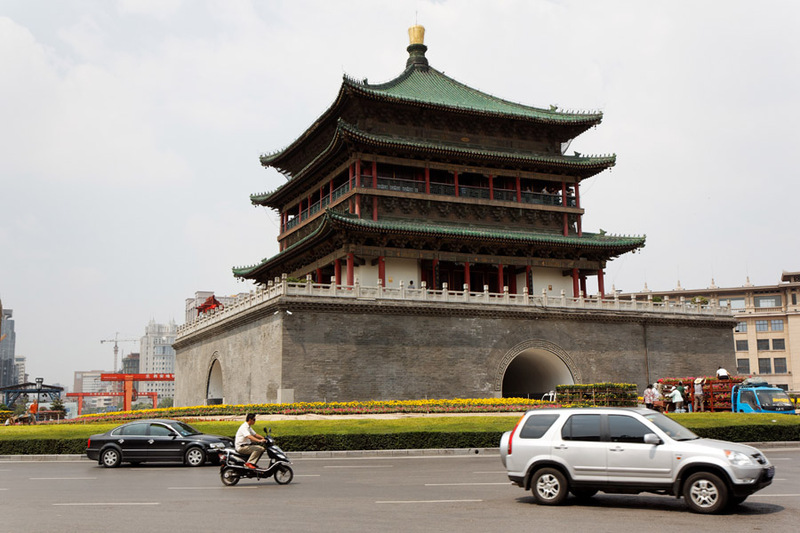 Depicted above is the Bell Tower in the very center of Xi'an. 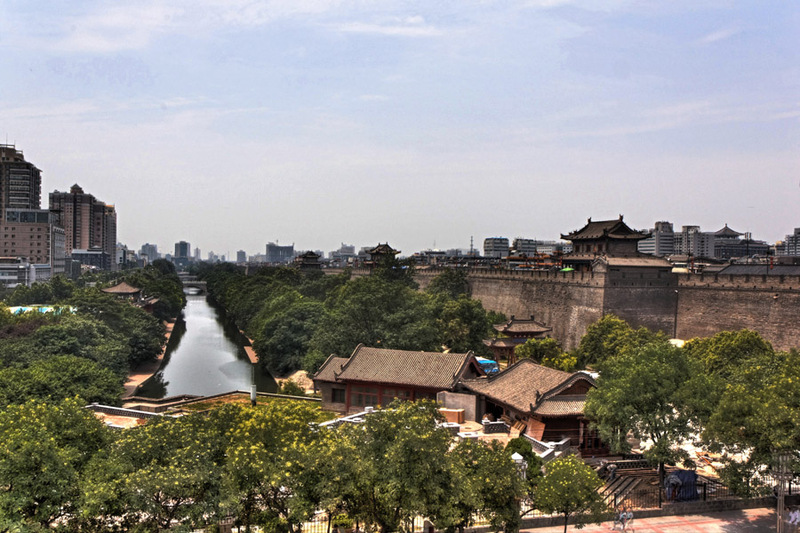 View from the bell tower towards the south gate. 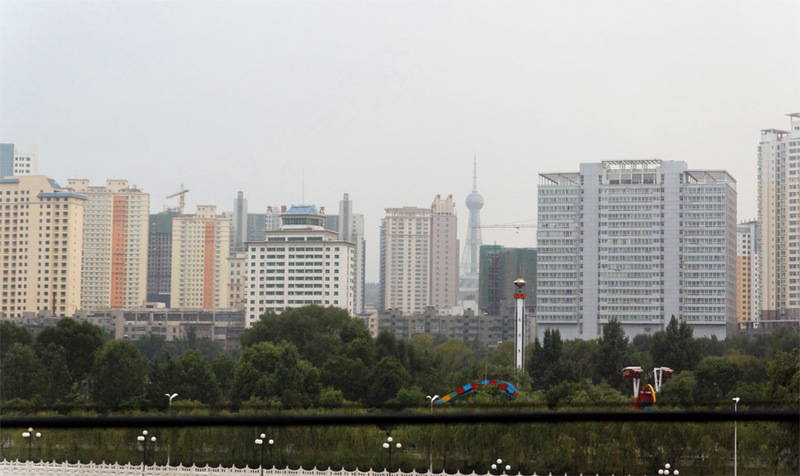 Xian contains a big muslim quarter. 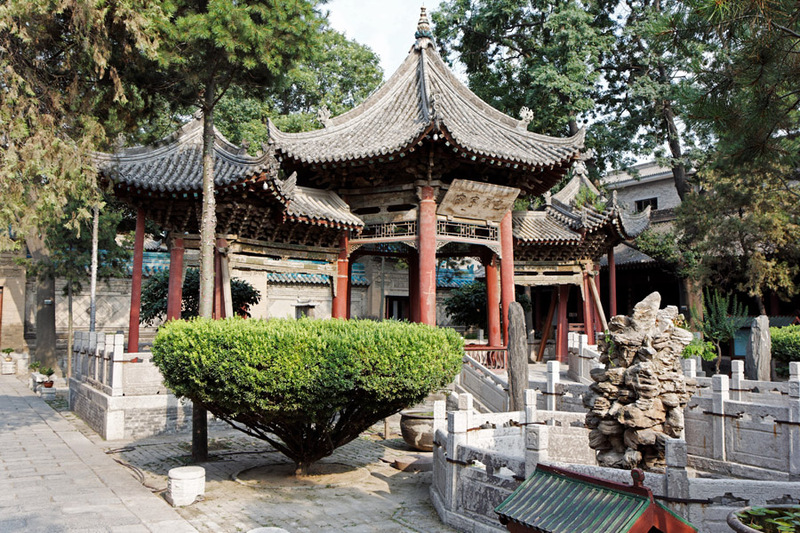 Although it doesn't look anything like it, but this here is inside the big mosque of Xi'an. 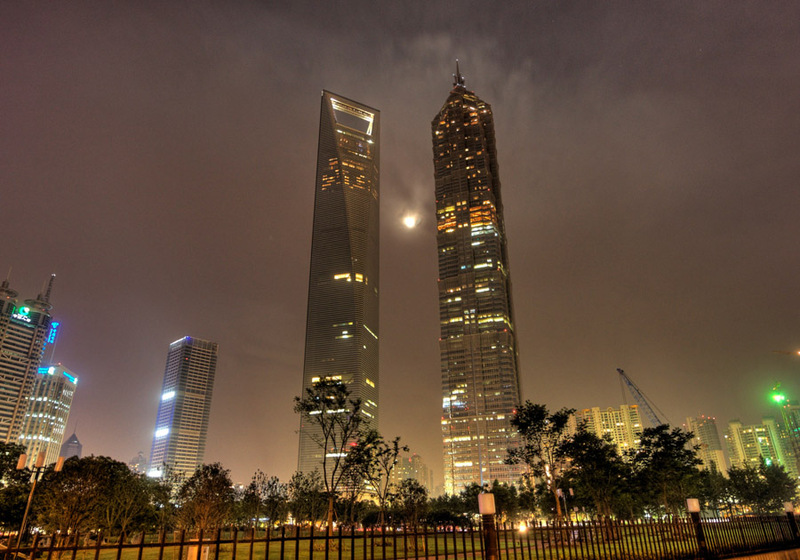 Shanghai World Financial Center (left, 492m) and Jinmao Tower (right, 421m). 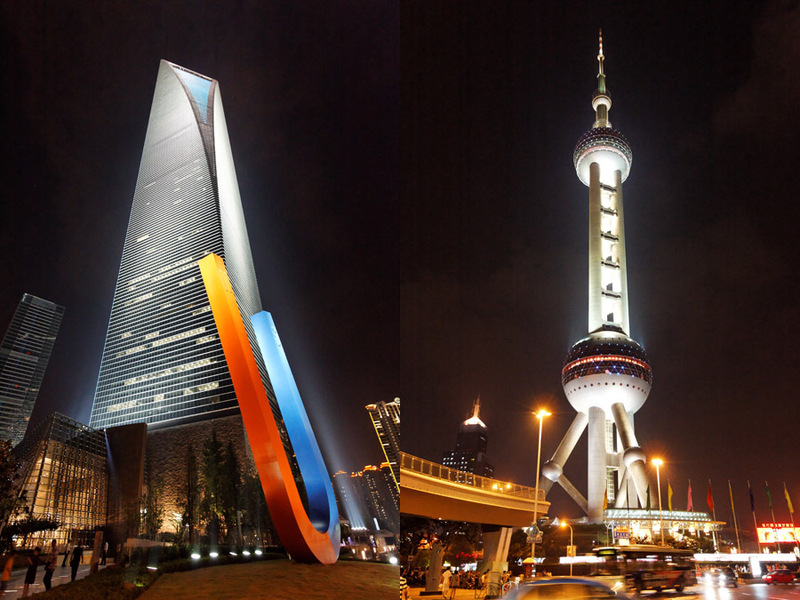 Both buildings will be topped in 2014 by the new Shanghai Tower which will rise to approximately 632 m. We visited this area between 10 and 11 pm. Except from taxis, busses and some construction workers the area (i.e. the park in front) was completely deserted. 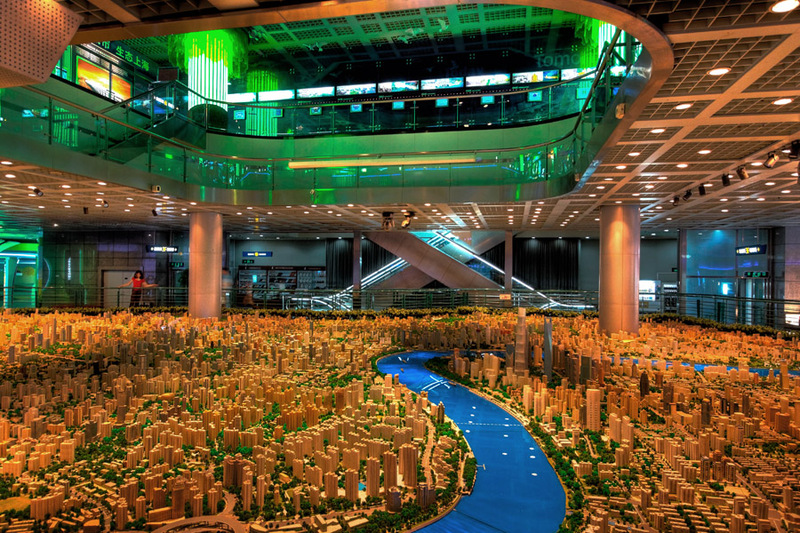 View from the exhibition hall to Renming Park. 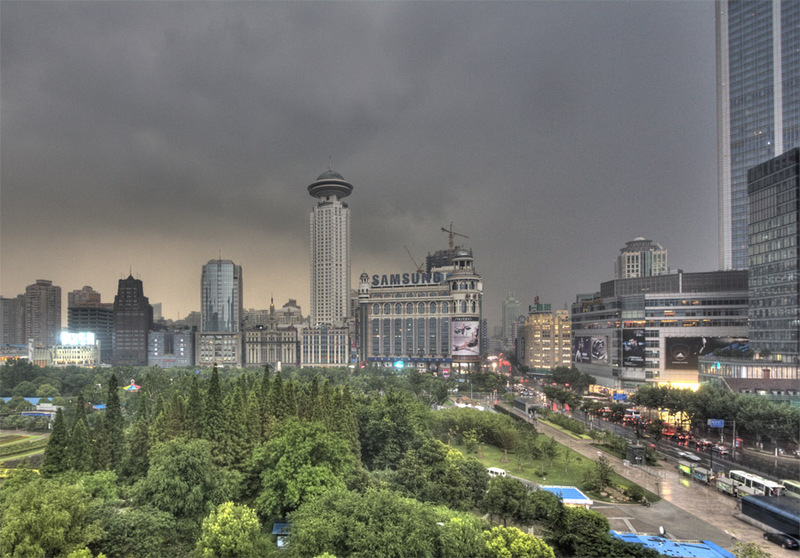 Just when we had to leave the museum this nasty thunderstorm had us running to the next subway station. 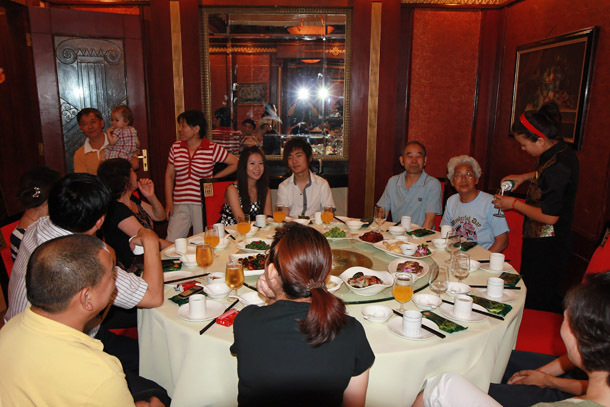 Family gathering chinese style. 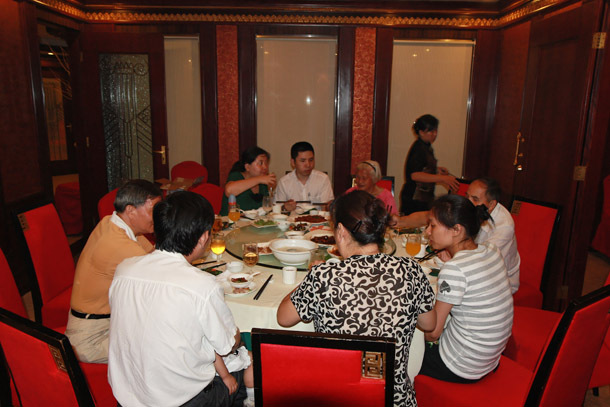 There was of course lots of food and Hong Baos. 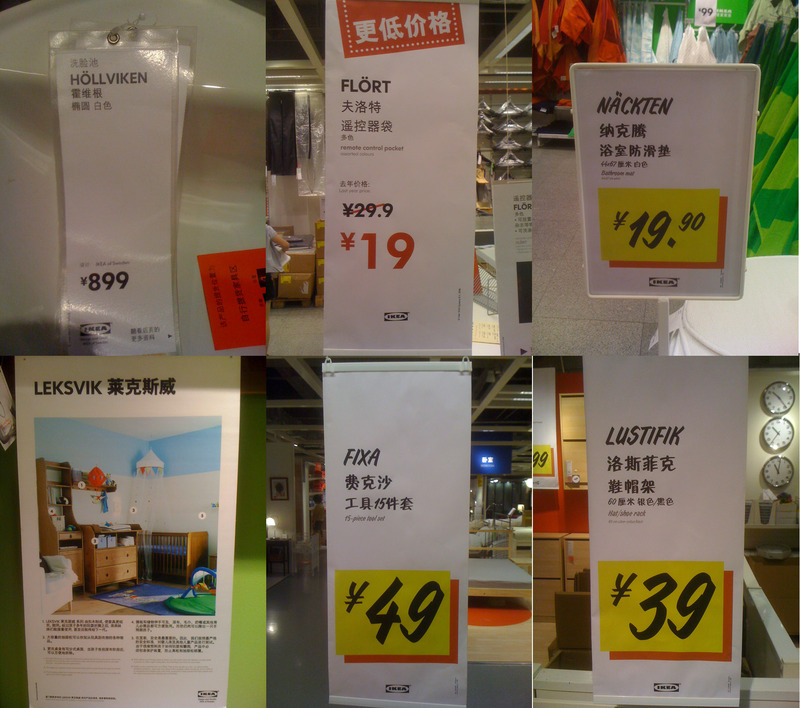 Our home is just behind the Ikea near the two sport stadiums. 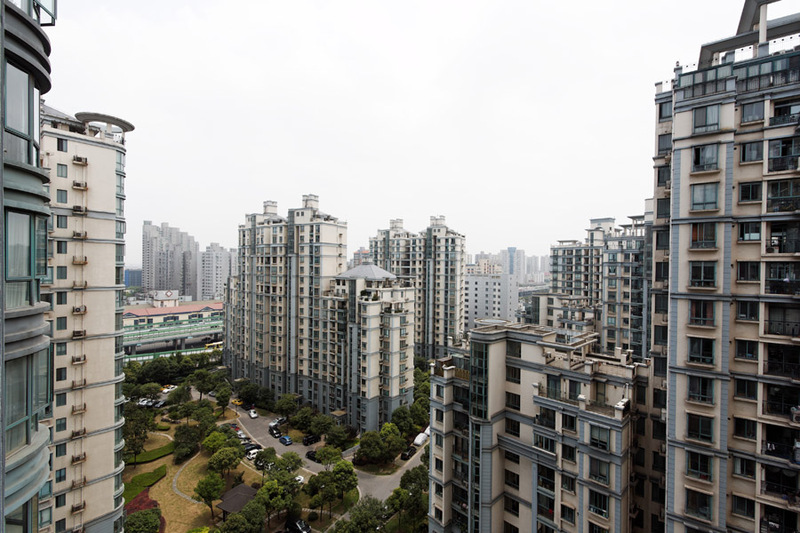 We're living on the 14th floor. Before anybody could leave the Boeing 747 four quarantine people dressed all in white came with laser scanners and scanned every person and baby. 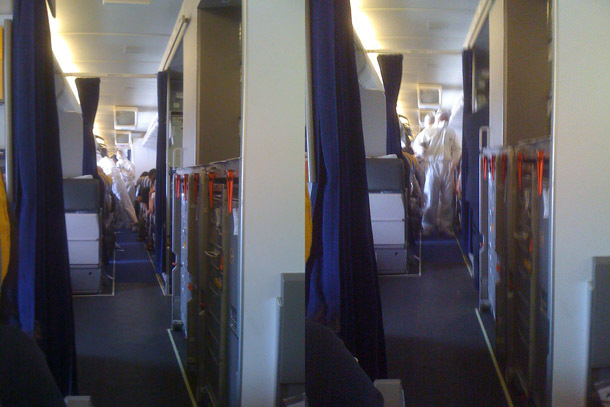 Later an inofficial source told us that if somebody had been caught with high temperature, the whole row, plus the rows in front and back would have had to be quarantined.